Our Hodson Bay Hotel sponsored senior team face neighbours and old time rivals Clann na nGael in the County final on Sunday 14th October at 4pm in Dr Hyde Park. 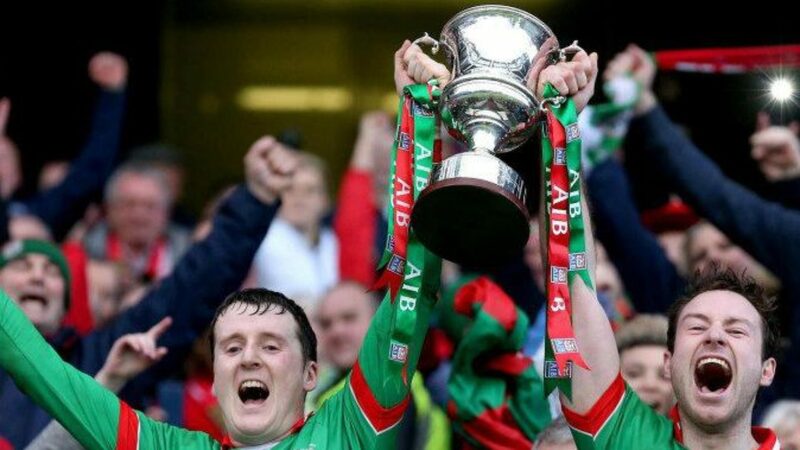 This is the first time the two teams have met at county final stage since the infamous final in 1997. Please get your bunting, flags, teddies etc. up and show your support for our players ahead of this big game. St Brigid’s U14’s contested the U14 Division 1 Shield final vs. Clann na nGael on a wet and windy evening in Kiltoom on October 1st under lights. Unfortunately for the St. Brigid’s lad they finished up on the wrong end of a high scoring encounter. The away team started stronger against the wind and after two minutes were 1-02 to no score ahead in a blistering start. Bobby Nugent settled the St Brigid’s lads with an excellent opening score for the home team. Soon after Luke Whelan popped over a point after good approach play involving James Dillion and Bobby Nugent. Alex O’Donohue was then fouled as he was advancing on goal, Nugent pointed the resulting free. The home team were now dominating possession and had a penalty after Brian Gonley was fouled as he burst through the Clann nanGael defence. Bobby Nugent made no mistake with the penalty with an excellent strike low and hard to the keepers right to make the scores 1-03 to 1-02 to the home team. St. Brigid’s continued to dominate possession but unfortunately had a wasteful five-minute period with four wides. Clann na nGael almost scored a goal but for a brilliant save from Matthew Samuels however they were not to be denied a second time as the home team were punished for their wastefulness with Clann scoring another goal. St. Brigid’s responded with another beautiful score from Nugent as he slalomed through the away defence before slotting over. Clann nanGael however responded again with yet another goal. Bobby Nugent was again on hand to score a point from a free after he was fouled. Nugent then scored another from play after an excellent 1:2 with Seán Minnock. As half time approached St. Brigid’s scored their second goal when Eanna McDonnell floated a ball towards the goal, Seán Minnock was on hand to punch the ball into the back of the net. Clann na nGael scored their third point of the half before Brian Gonley scored on the stroke of half time to end an entertaining half of football 2-07 to 3-03, a one-point half time lead for St. Brigid’s lads. Unfortunately for the home team the weather conditions worsened for the second half and Clann na nGael took full advantage. James Dillion scored a point immediately on the re-start however Clann na nGael responded by scoring 3-03 in the next ten minutes as the St. Brigid’s lads struggled to maintain possession. Bobby Nugent then scored with a free however ClannnaGael weren’t to be denied and pushed on to score another goal and a point. St Brigid’s to their credit finished strongly with Alex O’Donohue scoring an excellent long-range point against the wind and Brendan Murphy contributing 1-01 in the final minutes. This was an entertaining game in difficult conditions. Best for the St. Brigid’s lads was Eoin Reid for battled hard throughout and the excellent Bobby Nugent who drove his team forward at every opportunity scoring 1-06. This game finishes the 2018 season for the lads and all the lads can be immensely proud of their progression over the season. On behalf of the U14 coaching team sincere Thanks to all the lads for their commitment this year, enjoy the break as we look forward to the 2019 season with some of the lads progressing to U16. The club shop will be open on Friday night 12th October from 8-9pm. The shop has loads of flags, car flags, hats, jerseys, socks and shorts on sale ahead of the county final next weekend.